Spy tunnel in Cold War Berlin. Spying, as well as other intelligence assessment, has existed since ancient times. In the 1980s scholars characterized foreign intelligence as "the missing dimension" of historical scholarship. Since then a large popular and scholarly literature has emerged. Special attention has been paid to World War II, as well as the Cold War era (1947–1989) that was a favorite for novelists and film makers. A bamboo version of The Art of War, written by Sun Tzu in ancient China explores espionage tactics. Efforts to use espionage for military advantage are well documented throughout history. Sun Tzu, a theorist in ancient China who influenced Asian military thinking, still has an audience in the 21st century for the Art of War. He advised, "One who knows the enemy and knows himself will not be endangered in a hundred engagements." He stressed the need to understand yourself and your enemy for military intelligence. He identified different spy roles. In modern terms they included the secret informant or agent in place, (who provides copies of enemy secrets), the penetration agent who has access to the enemy's commanders, and the disinformation agent who feeds a mix of true and false details to point the enemy in the wrong direction, to confuse the enemy). He considered the need for systematic organization, and noted the roles of counterintelligence, double agents (recruited from the ranks of enemy spies) and psychological warfare. Sun Tzu continued to influence Chinese espionage theory in the 21st century with its emphasis on using information to design active subversion. Chanakya (also called Kautilya) wrote his Arthashastra in India in the 4th century BC. It was a 'Textbook of Statecraft and Political Economy' that provides a detailed account of intelligence collection, processing, consumption, and covert operations, as indispensable means for maintaining and expanding the security and power of the state. Ancient Egypt had a thoroughly developed system for the acquisition of intelligence, and the Hebrews used spies as well, as in the story of Rahab. Spies were also prevalent in the Greek and Roman empires. During the 13th and 14th centuries, the Mongols relied heavily on espionage in their conquests in Asia and Europe. Feudal Japan often used ninjas to gather intelligence. A significant milestone was the establishment of an effective intelligence service under King David IV of Georgia at the beginning of 12th century or possibly even earlier. Called mstovaris, these organized spies performed crucial tasks, like uncovering feudal conspiracies, conducting counter-intelligence against enemy spies, and infiltrating key locations, e.g. castles, fortresses and palaces. Many modern espionage methods were established by Francis Walsingham in Elizabethan England. His staff included the cryptographer Thomas Phelippes, who was an expert in deciphering letters and forgery, and Arthur Gregory, who was skilled at breaking and repairing seals without detection. The Catholic exiles fought back when The Welsh exile Hugh Owen created an intelligence service that tried to neutralize that of Walsingham. In 1585, Mary, Queen of Scots was placed in the custody of Sir Amias Paulet, who was instructed to open and read all of Mary's clandestine correspondence. In a successful attempt to expose her, Walsingham arranged a single exception: a covert means for Mary's letters to be smuggled in and out of Chartley in a beer keg. Mary was misled into thinking these secret letters were secure, while in reality they were deciphered and read by Walsingham's agents. He succeeded in intercepting letters that indicated a conspiracy to displace Elizabeth I with Mary, Queen of Scots. In foreign intelligence, Walsingham's extensive network of "intelligencers", who passed on general news as well as secrets, spanned Europe and the Mediterranean. While foreign intelligence was a normal part of the principal secretary's activities, Walsingham brought to it flair and ambition, and large sums of his own money. He cast his net more widely than anyone had attempted, exploiting links across the continent as well as in Constantinople and Algiers, and building and inserting contacts among Catholic exiles. The 18th century saw a dramatic expansion of espionage activities. It was a time of war: in nine years out of 10, two or more major powers were at war. Armies grew much larger, with corresponding budgets. Likewise the foreign ministries all grew in size and complexity. National budgets expanded to pay for these expansions, and room was found for intelligence departments with full-time staffs, and well-paid spies and agents. The militaries themselves became more bureaucratised, and sent out military attaches. They were very bright, personable middle-ranking officers stationed in embassies abroad. In each capital, the attached diplomats evaluated the strength, capabilities, and war plan plans of the armies and navies. France under King Louis XIV (1643–1715) was the largest, richest, and most powerful nation. It had many enemies and a few friends, and tried to keep track of them all through a well organized intelligence system based in major cities all over Europe. France and England pioneered the cabinet noir whereby foreign correspondence was opened and deciphered, then forwarded to the recipient. France's chief ministers, especially Cardinal Mazarin (1642–1661) did not invent the new methods; they combined the best practices from other states, and supported it at the highest political and financial levels. To critics of authoritarian governments, it appeared that spies were everywhere. Parisian dissidents of the 18th century thought that they were surrounded by as many as perhaps 30,000 police spies. However, the police records indicate a maximum of 300 paid informers. The myth was deliberately designed to inspire fear and hypercaution—the police wanted opponents people to think that they were under close watch. The critics also seemed to like the myth, for it gave them a sense of importance and an aura of mystery. Ordinary Parisians felt more secure believing that the police were actively dealing with troublemakers. To deal with the almost continuous wars with France, London set up an elaborate system to gather intelligence on France and other powers. Since the British had deciphered the code system of most states, it relied heavily on intercepted mail and dispatches. A few agents in the postal system could intercept likely correspondence and have it copied and forward to it to the intended receiver, as well as to London. Active spies were also used, especially to estimate military and naval strength and activities. Once the information was in hand, analysts tried to interpret diplomatic policies and intentions of states. Of special concern in the first half of the century where the activities of Jacobites—Englishmen who had French support in plotting to overthrow the Hanoverian kings of England. It was a high priority to find men in England and Scotland who had secret Jacobite sympathies. One highly successful operation took place in Russia under the supervision of minister Charles Whitworth (1704 to 1712). He closely observed public events and noted the changing power status of key leaders. He cultivated influential and knowledgeable persons at the royal court, and befriended foreigners in Russia's service, and in turn they provided insights into high-level Russian planning and personalities, which he summarized and sent in code to London. In 1719 Britain made it illegal to entice skilled workers to emigrate. Nevertheless, small-scale efforts two parts especially skilled experts continued in secret. At mid century, (1740s to 1770s) the French Bureau of Commerce had a budget and a plan, and systematically hired British and French spies to obtain industrial and military technology. they had some success deciphering English technology regarding plate-glass, the hardware and steel industry. They had mixed success, enticing some workers and getting foiled in other attempts. The Spanish were technological laggards, and tried to jump start industry through systematized industrial espionage. The Marquis of Ensenada, a minister of the king, sent trusted military officers on a series of missions between 1748 and 1760. They focused on current technology regarding shipbuilding, steam engines, copper refining, canals, metallurgy, and cannon-making. During the American Revolution, 1775–1783, American General George Washington developed a successful espionage system to detect British locations and plans. In 1778, he ordered Major Benjamin Tallmadge to form the Culper Ring to collect information about the British in New York. Washington was usually mindful of treachery, but he ignored incidents of disloyalty by Benedict Arnold, his most trusted general. Arnold tried to betray West Point to the British Army, but was discovered and barely managed to escape. The British intelligence system was weak—it completely missed the movement of the entire American and French armies from the Northeast to Yorktown, Virginia, where they captured the British invasion army in 1781 and won independence. Washington has been called "Americas First Spymaster". Britain, almost continuously at war with France (1793–1815), built a wide network of agents and funded local elements trying to overthrow governments hostile to Britain. It paid special attention to threats of an invasion of the home islands, and to a possible uprising in Ireland. Britain in 1794 appointed William Wickham as Superintendent of Aliens in charge of espionage and the new secret service. He strengthened the British intelligence system by emphasizing the centrality of the intelligence cycle – query, collection, collation, analysis and dissemination – and the need for an all-source centre of intelligence. Napoleon made heavy use of agents, especially regarding Russia. Besides espionage, they recruited soldiers, collected money, enforced the Continental System against imports from Britain, propagandized, policed border entry into France through passports, and protected the estates of the Napoleonic nobility. His senior men coordinated the policies of satellite countries. Tactical or battlefield intelligence became very vital to both armies in the field during the American Civil War. Allan Pinkerton, who operated a pioneer detective agency, served as head of the Union Intelligence Service during the first two years. He thwarted the assassination plot in Baltimore while guarding President-elect Abraham Lincoln. Pinkerton agents often worked undercover as Confederate soldiers and sympathizers to gather military intelligence. Pinkerton himself served on several undercover missions. He worked across the Deep South in the summer of 1861, collecting information on fortifications and Confederate plans. He was found out in Memphis and barely escaped with his life. Pinkerton's agency specialized in counter-espionage, identifying Confederate spies in the Washington area. Pinkerton played up to the demands of General George McClellan with exaggerated overestimates of the strength of Confederate forces in Virginia. McClellan mistakenly thought he was outnumbered, and played a very cautious role. Spies and scouts typically reported directly to the commanders of armies in the field. They provided details on troop movements and strengths. The distinction between spies and scouts was one that had life or death consequences. If a suspect was seized while in disguise and not in his army's uniform, the sentence was often to be hanged. Intelligence gathering for the Confederates focused on Alexandria, Virginia, and the surrounding area. Thomas Jordan created a network of agents that included Rose O'Neal Greenhow. Greenhow delivered reports to Jordan via the "Secret Line," the system used to smuggle letters, intelligence reports, and other documents to Confederate officials. The Confederacy's Signal Corps was devoted primarily to communications and intercepts, but it also included a covert agency called the Confederate Secret Service Bureau, which ran espionage and counter-espionage operations in the North including two networks in Washington. In both armies, the cavalry service was the main instrument in military intelligence, using direct observation, Drafting map, and obtaining copies of local maps and local newspapers. When General Robert E Lee invaded the North in June 1863, his cavalry commander J. E. B. Stuart went on a long unauthorized raid, so Lee was operating blind, unaware that he was being trapped by Union forces. Lee later said that his Gettysburg campaign, "was commenced in the absence of correct intelligence. It was continued in the effort to overcome the difficulties by which we were surrounded." During the Crimean War of 1854, the Topographical & Statistic Department T&SD was established within the British War Office as an embryonic military intelligence organization. The department initially focused on the accurate mapmaking of strategically sensitive locations and the collation of militarily relevant statistics. After the deficiencies in the British army's performance during the war became known a large-scale reform of army institutions was overseen by the Edward Cardwell. As part of this, the T&SD was reorganized as the Intelligence Branch of the War Office in 1873 with the mission to "collect and classify all possible information relating to the strength, organization etc. of foreign armies... to keep themselves acquainted with the progress made by foreign countries in military art and science..."
Field Marshal Helmuth von Moltke established a military intelligence unit, Abteilung (Section) IIIb, to the German General Staff in 1889 which steadily expanded its operations into France and Russia. The Italian Ufficio Informazioni del Commando Supremo was put on a permanent footing in 1900. After Russia's defeat in the Russo-Japanese War of 1904–05, Russian military intelligence was reorganized under the 7th Section of the 2nd Executive Board of the great imperial headquarters. In the United States the Naval intelligence originated in 1882 "for the purpose of collecting and recording such naval information as may be useful to the Department in time of war, as well as in peace." This was followed in October 1885 by the Military Information Division, the first standing military intelligence agency of the United States with the duty of collecting military data on foreign nations. The Okhrana was founded in Russia in 1880 and was tasked with countering enemy espionage. St. Petersburg Okhrana group photo, 1905. Russia's Okhrana was formed in 1880 to combat political terrorism and left-wing revolutionary activity throughout the Russian Empire, but was also tasked with countering enemy espionage. Its main concern was the activities of revolutionaries, who often worked and plotted subversive actions from abroad. It created an antenna in Paris run by Pyotr Rachkovsky to monitor their activities. The agency used many methods to achieve its goals, including covert operations, undercover agents, and "perlustration" — the interception and reading of private correspondence. The Okhrana became notorious for its use of agents provocateurs who often succeeded in penetrating the activities of revolutionary groups including the Bolsheviks. In the 1890s Alfred Dreyfus, a Jewish artillery captain in the French army, was twice falsely convicted of passing military secrets to the Germans. The case convulsed France regarding antisemitism, and xenophobia for a decade until he was fully exonerated. It raised public awareness of the rapidly developing world of espionage. Responsibility for military counter-espionage was passed in 1899 to the Sûreté générale – an agency originally responsible for order enforcement and public safety – and overseen by the Ministry of the Interior. 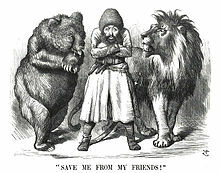 In Britain the Second Boer War (1899–1902) saw a difficult and highly controversial victory over hard-fighting whites in South Africa. One response was to build up counterinsurgency policies. After that came the "Edwardian Spy-Fever"—with rumours of German spies under every bed. At a time of widespread and growing anti-German feeling and fear, plans were drawn up for an extensive offensive intelligence system to be used as an instrument in the event of a European war. Due to intense lobbying by William Melville after he obtained German mobilization plans and proof of their financial support to the Boers, the government authorized the creation of a new intelligence section in the War Office, MO3 (subsequently redesignated M05) headed by Melville, in 1903. Working under cover from a flat in London, Melville ran both counterintelligence and foreign intelligence operations, capitalizing on the knowledge and foreign contacts he had accumulated during his years running Special Branch. For the first time, the government had access to a peacetime, centralized independent intelligence bureaucracy with indexed registries and defined procedures, as opposed to the more ad hoc methods used previously. Instead of a system whereby rival departments and military services would work on their own priorities with little to no consultation or co-operation with each other, the newly established Secret Intelligence Service was interdepartmental, and submitted its intelligence reports to all relevant government departments. The spy novel emerged as a distinct genre of fiction in the late 19th century; it dealt with themes such as colonial rivalry, the growing threat of conflict in Europe and the revolutionary and anarchist domestic threat. The "spy novel" was defined by The Riddle of the Sands (1903) by author Erskine Childers, which played on public fears of a German plan to invade Britain (an amateur spy uncovers the nefarious plot). In the wake of Childers's success there followed a flood of imitators, including William Le Queux and E. Phillips Oppenheim. The first World War (1914–1918) saw the honing and refinement of modern espionage techniques as all the belligerent powers utilized their intelligence services to obtain military intelligence, to commit acts of sabotage and to carry out propaganda. As the progress of the war became static and armies dug down in trenches, the utility of cavalry reconnaissance became of very limited effectiveness. In 1917, French authorities executed Mata Hari, a famous exotic dancer, on charges of espionage for Germany. German intelligence was only ever able to recruit a very small number of spies. These were trained at an academy run by the Kriegsnachrichtenstelle in Antwerp and headed by Elsbeth Schragmüller, known as "Fräulein Doktor". These agents were generally isolated and unable to rely on a large support network for the relaying of information. The most famous German spy was Margaretha Geertruida Zelle, a Dutch exotic dancer with the stage name Mata Hari. As a Dutch subject, she was able to cross national borders freely. In 1916, she was arrested and brought to London where she was interrogated at length by Sir Basil Thomson, Assistant Commissioner at New Scotland Yard. She eventually claimed to be working for French intelligence. In fact, she had entered German service from 1915, and sent her reports to the mission in the German embassy in Madrid. In January 1917, the German military attaché in Madrid transmitted radio messages to Berlin describing the helpful activities of a German spy code-named H-21. French intelligence agents intercepted the messages and, from the information it contained, identified H-21 as Mata Hari. She was executed by firing squad on 15 October 1917. In 1911, a subcommittee of the Committee of Imperial Defence on cable communications concluded that in the event of war with Germany, German-owned submarine cables should be destroyed. On the night of 3 August 1914, the cable ship Alert located and cut Germany's five trans-Atlantic cables, which ran under the English Channel. Soon after, the six cables running between Britain and Germany were cut. As an immediate consequence, there was a significant increase in messages sent via cables belonging to other countries, and by radio. These could now be intercepted, but codes and ciphers were naturally used to hide the meaning of the messages, and neither Britain nor Germany had any established organisations to decode and interpret the messages. At the start of the war, the navy had only one wireless station for intercepting messages, at Stockton. However, installations belonging to the Post Office and the Marconi Company, as well as private individuals who had access to radio equipment, began recording messages from Germany. Room 40, under Director of Naval Education Alfred Ewing, formed in October 1914, was the section in the British Admiralty most identified with the British crypto analysis effort during the war. The basis of Room 40 operations evolved around a German naval codebook, the Signalbuch der Kaiserlichen Marine (SKM), and around maps (containing coded squares), which were obtained from three different sources in the early months of the war. Alfred Ewing directed Room 40 until May 1917, when direct control passed to Captain (later Admiral) Reginald 'Blinker' Hall, assisted by William Milbourne James. A similar organization began in the Military Intelligence department of the War Office, which become known as MI1b, and Colonel Macdonagh proposed that the two organizations should work together, decoding messages concerning the Western Front in France. A sophisticated interception system (known as 'Y' service), together with the post office and Marconi receiving stations grew rapidly to the point it could intercept almost all official German messages. As the number of intercepted messages increased it became necessary to decide which were unimportant and should just be logged, and which should be passed on to Room 40. The German fleet was in the habit each day of wirelessing the exact position of each ship and giving regular position reports when at sea. It was possible to build up a precise picture of the normal operation of the High Seas Fleet, indeed to infer from the routes they chose where defensive minefields had been placed and where it was safe for ships to operate. Whenever a change to the normal pattern was seen, it immediately signalled that some operation was about to take place and a warning could be given. Detailed information about submarine movements was also available. Both the British and German interception services began to experiment with direction finding radio equipment at the start of 1915. Captain H. J. Round working for Marconi had been carrying out experiments for the army in France and Hall instructed him to build a direction finding system for the navy. Stations were built along the coast, and by May 1915 the Admiralty was able to track German submarines crossing the North Sea. Some of these stations also acted as 'Y' stations to collect German messages, but a new section was created within Room 40 to plot the positions of ships from the directional reports. No attempts were made by the German fleet to restrict its use of wireless until 1917, and then only in response to perceived British use of direction finding, not because it believed messages were being decoded. Room 40 played an important role in several naval engagements during the war, notably in detecting major German sorties into the North Sea that led to the battles of Dogger Bank and Jutland when the British fleet was sent out to intercept them. However its most important contribution was probably in decrypting the Zimmermann Telegram, a telegram from the German Foreign Office sent via Washington to its ambassador Heinrich von Eckardt in Mexico. In the Telegram's plain text, Nigel de Grey and William Montgomery learned of the German Foreign Minister Arthur Zimmermann's offer to Mexico to join the war as a German ally. The telegram was made public by the United States, which declared war on Germany on 6 April 1917. This event demonstrated how the course of a war could be changed by effective intelligence operations. The British were reading the Americans' secret messages by late 1915. The outbreak of revolution in Russia and the subsequent seizure of power by the Bolsheviks, a party deeply hostile towards the capitalist powers, was an important catalyst for the development of modern international espionage techniques. A key figure was Sidney Reilly, a Russian-born adventurer and secret agent employed by Scotland Yard and the Secret Intelligence Service. He set the standard for modern espionage, turning it from a gentleman's amateurish game to a ruthless and professional methodology for the achievement of military and political ends. Reilly's career culminated in an failed attempt to depose the Bolshevik Government and assassinate Vladimir Ilyich Lenin. In the course of a few months, Dukes, Hill, and Reilly succeeded in infiltrating Lenin's inner circle, and gaining access to the activities of the Cheka and the Communist International at the highest level. This helped to convince the government of the importance of a well-funded secret intelligence service in peacetime as a key component in formulating foreign policy. Churchill argued that intercepted communications were more useful "as a means of forming a true judgment of public policy than any other source of knowledge at the disposal of the State." The intelligence gathering efforts of Nazi Germany were largely ineffective. Berlin operated two espionage networks against the United States. Both suffered from careless recruiting, inadequate planning, and faulty execution. The FBI captured bungling spies, while poorly designed sabotage efforts all failed. Hitler's prejudices about Jewish control of the U.S. interfered with objective evaluation of American capabilities. His propaganda chief Joseph Goebbels deceived top officials who repeated his propagandistic exaggerations. Churchill's order to "set Europe ablaze," was undertaken by the British Secret Service or Secret Intelligence Service, who developed a plan to train spies and saboteurs. Eventually, this would become the SOE or Special Operations Executive, and to ultimately involve the United States in their training facilities. Sir William Stephenson, the senior British intelligence officer in the western hemisphere, suggested to President Roosevelt that William J. Donovan devise a plan for an intelligence network modeled after the British Secret Intelligence Service or MI6 and Special Operations Executive's (SOE) framework. Accordingly, the first American Office of Strategic Services (OSS) agents in Canada were sent for training in a facility set up by Stephenson, with guidance from English intelligence instructors, who provided the OSS trainees with the knowledge needed to come back and train other OSS agents. Setting German-occupied Europe ablaze with sabotage and partisan resistance groups was the mission. Through covert special operations teams, operating under the new Special Operations Executive (SOE) and the OSS' Special Operations teams, these men would be infiltrated into occupied countries to help organize local resistance groups and supply them with logistical support: weapons, clothing, food, money, and direct them in attacks against the Axis powers. Through subversion, sabotage, and the direction of local guerrilla forces, SOE British agents and OSS teams had the mission of infiltrating behind enemy lines and wreaked havoc on the German infrastructure, so much, that an untold number of men were required to keep this in check, and kept the Germans off balance continuously like the French maquis. They actively resisted the German occupation of France, as did the Greek People's Liberation Army (ELAS) partisans who were armed and fed by both the OSS and SOE during the German occupation of Greece. Magic was an American cryptanalysis project focused on Japanese codes in the 1930s and 1940s. It involved the U.S. Army's Signals Intelligence Service (SIS) and the U.S. Navy's Communication Special Unit. Magic combined cryptologic capabilities into the Research Bureau with Army, Navy and civilian experts all under one roof. Their most important successes involved RED, BLUE, and PURPLE. In 1923, a US Navy officer acquired a stolen copy of the Secret Operating Code codebook used by the Japanese Navy during World War I. Photographs of the codebook were given to the cryptanalysts at the Research Desk and the processed code was kept in red-colored folders (to indicate its Top Secret classification). This code was called "RED". In 1930, Japan created a more complex code that was codenamed BLUE, although RED was still being used for low-level communications. It was quickly broken by the Research Desk no later than 1932. US Military Intelligence COMINT listening stations began monitoring command-to-fleet, ship-to-ship, and land-based communications for BLUE messages. After Germany declared war in 1939, it sent technical assistance to upgrade Japanese communications and cryptography capabilities. One part was to send them modified Enigma machines to secure Japan's high-level communications with Germany. The new code, codenamed PURPLE (from the color obtained by mixing red and blue), baffled the codebreakers until they realized that it was not a manual additive or substitution code like RED and BLUE, but a machine-generated code similar to Germany's Enigma cipher. Decoding was slow and much of the traffic was still hard to break. By the time the traffic was decoded and translated, the contents were often out of date. A reverse-engineered machine could figure out some of the PURPLE code by replicating some of the settings of the Japanese Enigma machines. This sped up decoding and the addition of more translators on staff in 1942 made it easier and quicker to decipher the traffic intercepted. The Japanese Foreign Office used a cipher machine to encrypt its diplomatic messages. The machine was called "PURPLE" by U.S. cryptographers. A message was typed into the machine, which enciphered and sent it to an identical machine. The receiving machine could decipher the message only if set to the correct settings, or keys. American cryptographers built a machine that could decrypt these messages. The PURPLE machine itself was first used by Japan in 1940. U.S. and British cryptographers had broken some PURPLE traffic well before the attack on Pearl Harbor in December 1941, but the Japanese diplomats did not know or transmit any details.. The Japanese Navy used a completely different system, known as JN-25. U.S. cryptographers had decrypted and translated the 14-part Japanese PURPLE message breaking off ongoing negotiations with the U.S. at 1 p.m. Washington time on 7 December 1941, even before the Japanese Embassy in Washington could do so. As a result of the deciphering and typing difficulties at the embassy, the note was formally delivered after the attack began. Throughout the war, the Allies routinely read both German and Japanese cryptography. The Japanese Ambassador to Germany, General Hiroshi Ōshima, routinely sent priceless information about German plans to Tokyo. This information was routinely intercepted and read by Roosevelt, Churchill and Eisenhower. Japanese diplomats assumed their PURPLE system was unbreakable and did not revise or replace it. President Franklin Roosevelt was obsessed with intelligence and Deeply worried about German sabotage. However, there was no overarching American intelligence agency, and Roosevelt left the Army, the Navy, the State Department, and various other sources compete against each other, so that all the information poured into the White House, but was not systematically shared with other agencies. The British Roosevelt's fascination early on, and that him intelligence designed to bolster the British patient, such as false claims of the Germans had designs on taking over Latin America. Roosevelt followed MAGIC intercept Japan religiously, but set it up so that the Army and Navy briefed him on alternating days. Finally he turned to William (Wild Bill) Donovan to run a new agency the Office of the Coordinator of Information (COI) which in 1942 became the Office of Strategic Services or OSS. It became Roosevelt's most trusted source of secrets, and after the war OSS eventually became the CIA. The COI had a staff of 2,300 in June 1942; OSS reached 5,000 personnel by September 1943. In all 35,000 men and women served in the OSS by the time it closed in 1947. The Army and Navy were proud of their long-established intelligence services and avoided the OSS as much as possible, banning it from the Pacific theaters. The Army tried and failed to prevent OSS operations in China. An agreement with Britain in 1942 divided responsibilities, with SOE taking the lead for most of Europe, including the Balkans and OSS took primary responsibility for China and North Africa. OSS experts and spies were trained at facilities in the United States and around the world. The military arm of the OSS, was the Operational Group Command (OGC), which operated sabotage missions in in the European and Mediterranean theaters, with a special focus on Italy and the Balkans. OSS was a rival force with SOE in Italy in aiding and directing anti-Nazi resistance groups. The "Research and Analysis" branch of OSS brought together numerous academics and experts who proved especially useful in providing a highly detailed overview of the strengths and weaknesses of the German war effort. In direct operations it was successful in supporting Operation Torch in French North Africa in 1942, where it identified pro-Allied potential supporters and located landing sites. OSS operations in neutral countries, especially Stockholm, Sweden, provided in-depth information on German advanced technology. The Madrid station set up agent networks in France that supported the Allied invasion of southern France in 1944. Most famous were the operations in Switzerland run by Allen Dulles that provided extensive information on German strength, air defenses, submarine production, and the V-1 and V-2 weapons. It revealed some of the secret German efforts in chemical and biological warfare. Switzerland's station also supported resistance fighters in France and Italy, and helped with the surrender of German forces in Italy in 1945. Secrecy campaigns were designed to stop spreading negative rumors or true facts that might depress morale—foiling spies was not the goal. The MI5 in Britain and the FBI in the U.S. identified all the German spies, and "turned" all but one into double agents so that their reports to Berlin were actually rewritten by counterespionage teams. The FBI had the chief role in American counterespionage and rounded up all the German spies in June 1941. Counterespionage included the use of turned Double Cross agents to misinform Nazi Germany of impact points during the Blitz and internment of Japanese in the US against "Japan's wartime spy program". Additional WWII espionage examples include Soviet spying on the US Manhattan project, the German Duquesne Spy Ring convicted in the US, and the Soviet Red Orchestra spying on Nazi Germany. A tape recorder on display in Moscow. After 1990s new memoirs and archival materials have opened up the study of espionage and intelligence during the Cold War. Scholars are reviewing how its origins, its course, and its outcome were shaped by the intelligence activities of the United States, the Soviet Union, and other key countries. Special attention is paid to how complex images of one's adversaries were shaped by secret intelligence that is now publicly known. All major powers engaged in espionage, using a great variety of spies, double agents, and new technologies such as the tapping of telephone cables. The most famous and active organizations were the American CIA, the Soviet KGB, and the British MI6. The East German Stasi, unlike the others, was primarily concerned with internal security, but its Main Directorate for Reconnaissance operated espionage activities around the world. The CIA secretly subsidized and promoted anti-communist cultural activities and organizations. The CIA was also involved in European politics, especially in Italy. Espionage took place all over the world, but Berlin was the most important battleground for spying activity. The USSR and East Germany proved especially successful in placing spies in Britain and West Germany. Moscow was largely unable to repeat its successes from 1933–45 in the United States. NATO, on the other hand, also had a few successes of importance, of whom Oleg Gordievsky was perhaps the most influential. He was a senior KGB officer who was a double agent on behalf of Britain's MI6, providing a stream of high-grade intelligence that had an important influence on the thinking of Margaret Thatcher and Ronald Reagan in the 1980s. He was spotted by Aldrich Ames a Soviet agent who worked for the CIA, but he was successfully exfiltrated from Moscow in 1985. Biographer Ben McIntyre argues he was the West's most valuable human asset, especially for his deep psychological insights into the inner circles of the Kremlin. He convinced Washington and London that the fierceness and bellicosity of the Kremlin was a product of fear, and military weakness, rather than an urge for world conquest. Thatcher and Reagan concluded they could moderate their own anti-Soviet rhetoric, as successfully happened when Mikhail Gorbachev took power, thus ending the Cold War. Since the 19th century new approaches have included professional police organizations, the police state and geopolitics. New intelligence methods have emerged, most recently imagery intelligence, signals intelligence, cryptanalysis and spy satellites. The most dramatic failure of intelligence in this era was the false discovery of weapons of mass destruction in Iraq in 2003. American and British intelligence agencies agreed on balance that the WMD were being built and would threaten the peace. They launched a full-scale an invasion that overthrew the Iraqi government of Saddam Hussein. The result was decades of turmoil and large-scale violence. There were in fact no weapons of mass destruction, but the Iraqi government had pretended they existed so that it could deter the sort of attack that in fact resulted. In Israel, the Shin Bet unit is the agency for homeland security and counter intelligence. The department for secret and confidential counter terrorist operations is called Kidon. It is part of the national intelligence agency Mossad and can also operate in other capacities. Kidon was described as "an elite group of expert assassins who operate under the Caesarea branch of the espionage organization." The unit only recruits from "former soldiers from the elite IDF special force units." There is almost no reliable information available on this ultra-secret organisation. 11 German spies were executed in the Tower of London. Spying has sometimes been considered a gentlemanly pursuit, with recruiting focused on military officers, or at least on persons of the class from whom officers are recruited. However, the demand for male soldiers, an increase in women's rights, and the tactical advantages of female spies led the British Special Operations Executive (SOE) to set aside any lingering Victorian Era prejudices and begin employing women in April 1942. Their task was to transmit information from Nazi occupied France back to Allied Forces. The main strategic reason was that men in France faced a high risk of being interrogated by Nazi troops but women were less likely to arouse suspicion. In this way they made good couriers and proved equal to, if not more effective than, their male counterparts. Their participation in Organization and Radio Operation was also vital to the success of many operations, including the main network between Paris and London. ^ John Prados, "Of Spies and Stratagems." in Thomas W. Zeiler, ed., A Companion to World War II (2012) 1: 482–500. ^ Derek M. C. Yuen (2014). Deciphering Sun Tzu: How to Read 'The Art of War'. pp. 110–111. ISBN 9780199373512. ^ Dany Shoham and Michael Liebig. "The intelligence dimension of Kautilyan statecraft and its implications for the present." Journal of Intelligence History 15.2 (2016): 119–138. ^ "Espionage in Ancient Rome". HistoryNet. ^ Aladashvili, Besik (2017). Fearless: A Fascinating Story of Secret Medieval Spies. ^ Soustelle, Jacques (2002). The Daily Life of the Aztecas. Phoenix Press. p. 209. ISBN 978-1-84212-508-3. ^ Andrew, Secret World (2018) pp 158–90. ^ a b Hutchinson, Robert (2007) Elizabeth's Spy Master: Francis Walsingham and the Secret War that Saved England. London: Weidenfeld & Nicolson. ISBN 978-0-297-84613-0. pp. 84–121. ^ Anna Maria Orofino, "'Coelum non animum mutant qui trans mare currunt': David Stradling (1537–c. 1595) and His Circle of Welsh Catholic Exiles in Continental Europe." British Catholic History 32.2 (2014): 139–158. ^ Christopher Andrew, The Secret World: A History of Intelligence (2018), pp 242–91. ^ William James Roosen (1976). The Age of Louis XIV: The Rise of Modern Diplomacy. pp. 147–56. ISBN 9781412816670. ^ Alan Williams, "Domestic Espionage and the Myth of Police Omniscience in Eighteenth-Century Paris" Consortium on Revolutionary Europe 1750–1850: Proceedings (1979), Vol. 8, pp 253–260. ^ Jeremy Black, "British intelligence and the mid‐eighteenth‐century crisis." Intelligence and National Security 2#2 (1987): 209–229. ^ T. L. Labutina, "Britanskii Diplomat I Razvedchik Charl'z Uitvort Pri Dvore Petra I." ["British diplomat and spy Charles Whitworth at the court of Peter I"] Voprosy Istorii (2010), Issue 11, p 124-135, in Russian. ^ John R. Harris, "The Rolt Memorial Lecture, 1984 Industrial Espionage in the Eighteenth Century." Industrial Archaeology Review 7.2 (1985): 127–138. ^ J.R. Harris, "French Industrial Espionage in Britain in the Eighteenth Century," Consortium on Revolutionary Europe 1750–1850: Proceedings (1989) Part 1, Vol. 19, pp 242–256. ^ Paul R. Misencik (2013). The Original American Spies: Seven Covert Agents of the Revolutionary War. p. 157. ISBN 9781476612911. ^ John A. Nagy, George Washington's Secret Spy War: The Making of Americas First Spymaster (2016) calls him "the eighteenth century's greatest spymaster" (p. 274). ^ Roger Knight, Britain Against Napoleon: The Organization of Victory, 1793–1815 (2013) pp 122–52, 251–312. ^ Knight, Britain Against Napoleon: The Organization of Victory, 1793–1815 (2013) pp 125–42. ^ Edward A. Whitcomb, "The Duties and Functions of Napoleon's External Agents." History 57#190 (1972): 189–204. ^ Philip H.J. Davies (2012). Intelligence and Government in Britain and the United States: A Comparative Perspective. ABC-CLIO. ISBN 9781440802812. ^ James Mackay, Allan Pinkerton: The First Private Eye (1996) downplays the exaggeration. ^ E.C. Fishel, The Secret War for The Union: The Untold Story of Military Intelligence in the Civil War (1996). ^ Harnett, Kane T. (1954). Spies for the Blue and the Gray. Hanover House. pp. 27–29. ^ Markle, Donald E. (1994). Spies and Spymasters of the Civil War. Hippocrene Books. p. 2. ISBN 978-0781802277. ^ Warren C. Robinson (2007). Jeb Stuart and the Confederate Defeat at Gettysburg. U of Nebraska Press. pp. 38, 124–29, quoting p 129. ISBN 978-0803205659. ^ Thomas G. Fergusson (1984). British Military Intelligence, 1870–1914: The Development of a Modern Intelligence Organization. University Publications of America. p. 45. ISBN 9780890935415. ^ Dorril, Stephen (2002). MI6: Inside the Covert World of Her Majesty's Secret Intelligence Service. Simon & Schuster. p. 137. ISBN 978-0-7432-1778-1. ^ "A Short History of Army Intelligence" (PDF). Michael E. Bigelow (Command Historian, United States Army Intelligence and Security Command. 2012. p. 10. ^ Jonathan W. Daly, The Watchful State: Security Police and Opposition in Russia, 1906–1917 (2004). ^ Douglas Porch, The French Secret Services: From the Dreyfus Affair to the Gulf War (1995). ^ Jules J.S. Gaspard, "A lesson lived is a lesson learned: a critical re-examination of the origins of preventative counter-espionage in Britain." Journal of Intelligence History 16.2 (2017): 150–171. ^ Calder Walton (2013). Empire of Secrets: British Intelligence, the Cold War, and the Twilight of Empire. Overlook. pp. 5–6. ISBN 9781468310436. ^ Cook, Chris. Dictionary of Historical Terms (1983) p. 95. ^ a b c "Espionage". International Encyclopedia of the First World War (WW1). ^ "Walthère Dewé". Les malles ont une mémoire 14–18. Retrieved 2014-04-09. ^ Adams, Jefferson (2009). Historical Dictionary of German Intelligence. Rowman&Littlefield. p. 290. ISBN 978-0-8108-5543-4. ^ Hansard, HC 5ser vol 65 col 1986. ^ Christopher Andrew, "The Defence of the Realm: The Authorised History of MI5", Allen Lane, 2009, pp. 49–52. ^ Jules C. Silber, The Invisible Weapons, Hutchinson, 1932, Londres, D639S8S5. ^ a b Douglas L. Wheeler. "A Guide to the History of Intelligence 1800–1918" (PDF). Journal of U.S. Intelligence Studies. ^ Winkler 2009, pp. 848–849. ^ a b Beesly, Patrick (1982). Room 40: British Naval Intelligence, 1914–1918. Long Acre, London: Hamish Hamilton Ltd. pp. 2–14. ISBN 978-0-241-10864-2. ^ Johnson 1997, pp. 32. ^ Denniston, Robin (2007). Thirty secret years: A.G. Denniston's work for signals intelligence 1914–1944. Polperro Heritage Press. ISBN 978-0-9553648-0-8. ^ Johnson, John (1997). The Evolution of British Sigint, 1653–1939. London: H.M.S.O. ^ Tuchman, Barbara W. (1958). The Zimmermann Telegram. New York: Ballantine Books. ISBN 978-0-345-32425-2. ^ "These Are the Guys Who Invented Modern Espionage". History News Network. ^ Michael I. Handel (2012). Leaders and Intelligence. Routledge. p. 188. ISBN 9781136287169. ^ "Operation Magic". Faqs.org. Retrieved 2013-09-23. ^ Ronald Lewin, The American Magic: Codes, Ciphers and the Defeat of Japan (1982). ^ Edward J. Drea, MacArthur's ULTRA: Codebreaking and the War against Japan, 1942–1945 (1992). ^ Boyd, Carl Boyd, Hitler's Japanese Confidant: General Ōshima Hiroshi and MAGIC Intelligence, 1941–1945 (1993). ^ Joseph E. Persico, Roosevelt's Secret War: FDR and World War II Espionage (2001) p 329. ^ See John Whiteclay Chambers II, OSS Training in the National Parks and Service Abroad in World War II (NPS, 2008). p 33. ^ Maochun Yu (2013). OSS in China: Prelude to Cold War. Naval Institute Press. p. 20. ISBN 9781612510590. ^ Chambers, OSS Training" ]. ^ George C. Chalou, ed., The Secrets War: The Office of Strategic Services in World War II (2016) pp 43–77. ^ G.J.A. O'Toole, Honorable Treachery: A History of U. S. Intelligence, Espionage, and Covert Action from the American Revolution to the CIA (1991) pp 418–19. ^ Chalou, ed., The Secrets War (2016) pp 122–353. ^ D'Ann Campbell, Women at War with America: Private Lives in a Patriotic Era (1984) p 71. ^ Joseph E. Persico (2002). Roosevelt's Secret War: FDR and World War II Espionage. Random House. p. 115. ISBN 978-0-375-76126-3. ^ Michael F. Hopkins, "Continuing debate and new approaches in Cold War history." Historical Journal 50.4 (2007): 913–934. ^ "Offices of CIA > Clandestine Service > Who We Are". cia.gov. Retrieved 2010-06-18. ^ "Offices of CIA > Clandestine Service > Our Mission". cia.gov. Retrieved 2010-06-18. ^ Giovanni Coletta, "Politicising intelligence: what went wrong with the UK and US assessments on Iraqi WMD in 2002" Journal of Intelligence History (2018) 17#1 pp 65–78 is a scholarly analysis..
^ Michael Isikoff and David Corn. Hubris: The inside story of spin, scandal, and the selling of the Iraq War (2006) is journalistic. ^ a b Melman, Yossi (19 February 2010). "Kidon, the Mossad within the Mossad". Haaretz. Retrieved 9 March 2013. ^ "Famous Spies in History, CNN". Archives.cnn.com. 2001-02-21. Archived from the original on 2013-08-21. Retrieved 2012-07-07. ^ Sellers, Leonard (2009). Shot in the Tower: The Story of the Spies Executed in the Tower of London During the First World War. Pen & Sword Military. ISBN 978-1848840263. ^ "Special Operations Executive". Spartacus Educational. Archived from the original on 2013-08-02. Jeffreys-Jones Rhodri. In spies we trust: the story of Western intelligence (2015)-870190-3. Boghardt, Thomas. Spies of the Kaiser: German Covert Operations in Great Britain during the First World War Era (2004). Boghardt, Thomas. The Zimmermann telegram: intelligence, diplomacy, and America's entry into World War I (2012). Dockrill, Michael. and David French, eds. Strategy and Intelligence: British Policy During the First World War (1996). Finnegan, Terrance. "The Origins of Modern Intelligence, Surveillance, and Reconnaissance: Military Intelligence at the Front, 1914–18," Studies in Intelligence 53#4 (2009) pp. 25–40. Foley, Robert T. "Easy Target or Invincible Enemy? German Intelligence Assessments of France Before the Great War." Journal of Intelligence History 5#2 (2005): 1–24. Hiley, Nicholas. "The Failure of British Counter-espionage against Germany, 1907–1914," Historical Journal 28#4 (1985) pp. 835–62. Hiley, Nicholas. "Entering the Lists: MI5's Great Spy Round-up of August 1914." Intelligence and National Security 21#1 (2006) pp. 46–76. Kahn, David. "Codebreaking in World Wars I and II: The Major Successes and Failures, Their Causes and Their Effects", Historical Journal 23#3 (1980) pp. 617–39. Mount, Graeme. Canada's Enemies: Spies and Spying in the Peaceable Kingdom (1993) ch.3. Pöhlmann, Markus. "German Intelligence at War, 1914–1918." Journal of Intelligence History 5.2 (2005): 25–54. Spence, Richard B. "K.A. Jahnke and the German Sabotage Campaign in the United States and Mexico, 1914–1918," Historian 59#1 (1996) pp.89–112. Witcover, Jules. Sabotage at Black Tom: Imperial Germany's Secret War in America, 1914–1917 (1989). Breuer, William B. The Secret War with Germany: Deception, Espionage, and Dirty Tricks, 1939–1945 (Presidio Press, 1988). Chambers II, John Whiteclay. OSS Training in the National Parks and Service Abroad in World War II (NPS, 2008) online; chapters 1–2 and 8–11 provide a useful summary history of OSS by a scholar. Crowdy, Terry. Deceiving Hitler: Double Cross and Deception in World War II (Osprey, 2008). Drea, Edward J. MacArthur's ULTRA: Codebreaking and the War against Japan, 1942–1945 (1992). Farago, Ladislas. The game of the foxes: the untold story of German espionage in the United States and Great Britain during World War II (1971), popular. Haufler, Hervie. Codebreakers' Victory: How the Allied Cryptographers Won World War II (2014). Hinsley, F. H., et al. British Intelligence in the Second World War (6 vol. 1979). Jörgensen, Christer. Spying for the Fuhrer: Hitler's Espionage Machine (2014). Kahn, David. "Codebreaking in World Wars I and II: The Major Successes and Failures, Their Causes and Their Effects", Historical Journal 23#3 (1980) pp.617–39. Lewin, Ronald. The American magic: codes, ciphers, and the defeat of Japan (1984). Paine, Lauran. German Military Intelligence in World War II: The Abwehr (1984). Smith, Bradley F. The Shadow Warriors: OSS and the Origins of the CIA (1983) for U.S.A.
Stephan, Robert W. Stalin's secret war: Soviet counterintelligence against the Nazis, 1941–1945 (2004). Alexander, Martin S. "Did the Deuxième Bureau work? The role of intelligence in French defence policy and strategy, 1919–39." Intelligence and National Security 6.2 (1991): 293–333. Bauer, Deborah Susan. Marianne is Watching: Knowledge, Secrecy, Intelligence and the Origins of the French Surveillance State (1870–1914). (PhD Dissertation, UCLA, 2013.) Online Bibliography pp 536–59. Jackson, Peter. France and the Nazi Menace: Intelligence and Policy Making, 1933–1939 (2000). Whitcomb, Edward A. "The Duties and Functions of Napoleon's External Agents." History 57.190 (1972): 189–204. Andrew, Christopher. Defend the Realm: The Authorized History of MI5 (2009). Johnson, Robert. Spying for Empire: The Great Game in Central and South Asia, 1757–1947 (2006), Britain versus Russia. Walton, Calder. Empire of Secrets: British Intelligence in the Cold War and the Twilight of Empire (2014). West, Nigel. MI6: British Secret Intelligence Service Operations 1909–1945 (1983). Halsam, Jonathan. Near and distant neighbours. A new history of Soviet intelligence (2015); 390pp. Hingley, Ronald. The Russian Secret Police: Muscovite, Imperial Russian and Soviet Political Security Operations (1971). Macintyre, Ben. A Spy Among Friends: Kim Philby and the Great Betrayal (2014), Soviet spies in UK. Marten, Kimberly. "The 'KGB State' and Russian Political and Foreign Policy Culture." Journal of Slavic Military Studies 30.2 (2017): 131–151. Pandis, Robert. CHEKA – The History, Organization and Awards of the Russian Secret Police & Intelligence Services 1917–2017 (2017), covers GPU, OGPU, NKVD, MVD, MOOP, KGB, PGU, FSB, SVR, and GRU. Pringle, Robert W. Historical dictionary of Russian and Soviet intelligence (2015). Ruud, Charles A. and Sergei A. Stepanov. Fontanka 16: The Tsars' Secret Police (1999). Seliktar, Ofira. Politics, Paradigms, and Intelligence Failures: Why So Few Predicted the Collapse of the Soviet Union (2015). Andrew, Christopher. For the President's Eyes Only: Secret Intelligence and the American Presidency from Washington to Bush (1995), covers each presidency. Fishel, Edwin C. The secret war for the Union: the untold story of military intelligence in the Civil War (1996) online free to borrow. Friedman, George. America's Secret War: Inside the Hidden Worldwide Struggle Between the United States and Its Enemies (2005). Goldman, Jan, ed. The Central Intelligence Agency: An Encyclopedia of Covert Ops, Intelligence Gathering, and Spies (2 vol. 2015). Prados, John. Presidents' Secret Wars: CIA and Pentagon Covert Operations from World War II Through the Persian Gulf War (1996). Smith Jr., W. Thomas. Encyclopedia of the Central Intelligence Agency (2003). Bezci, Egemen B. "Turkey's intelligence diplomacy during the Second World War." Journal of Intelligence History 15.2 (2016): 80–95. Davies, Philip H. J., and Kristian C. Gustafson. eds. Intelligence Elsewhere: Spies and Espionage Outside the Anglosphere (2013). Lasoen, Kenneth L. "185 years of Belgian security service." Journal of Intelligence History 15.2 (2016): 96–118. Sirrs, Owen L. Pakistan's inter-services intelligence directorate: covert action and internal operations (2016) covers 1947 to 2011. Stone, James. "Spies and diplomats in Bismarck's Germany: collaboration between military intelligence and the Foreign Office, 1871–1881." Journal of Intelligence History 13.1 (2014): 22–40. This page was last edited on 24 April 2019, at 21:36 (UTC).